Nissan has been assembling vehicles in Canton, Miss., since 2003. The $1.4 billion plant has emerged as a target of the UAW. A Nissan Motor Co. plant deep in the American South has emerged as a proving ground for the UAW's new model to turn around three decades of failure to unionize foreign auto plants on U.S. soil. In the last half year, the UAW has quietly contacted Nissan workers at the Japanese automaker's plant in Canton, Miss., near the state capital of Jackson. The effort was revealed this week by union officials, state politicians and civil rights leaders. It is the first time since UAW President Bob King announced in 2010 a new push to organize Japanese, German and Korean auto plants that the UAW has publicly set sights on a specific factory. King said Nissan has held "captive audience" meetings for months designed to scare Canton workers and disparage the union, which is seeking to organize the plant's roughly 3,000 manufacturing workers. He and other union supporters described the meetings as a violation of worker civil rights and called on Nissan to allow the union to make its pitch directly to plant workers. "Fear and intimidation should not be part of the equation when workers are deciding whether they want to be represented by the union," King said. "Workers should be able to hear equally from both sides and make a decision for themselves." Nissan spokesman David Reuter said the company respects worker rights to organize and its reputation stands in "sharp contrast" to the UAW's description. He said Nissan has raised the topic of unions with workers over the past month, but disputed King's characterization of the meetings. King has said the UAW has no future if it fails to organize foreign auto assembly factories in the United States. It is a battle that the UAW has lost at almost every turn since the 1980s. The failure to win new auto plant members has compounded a crunch on the UAW's finances. In interviews set up by the UAW, two Nissan workers at the Canton plant told Reuters that they want a stronger voice in how workers are compensated. Many workers at the plant are under the impression that they could lose their jobs if the plant is organized, said the workers and Derrick Johnson, president of the Mississippi NAACP. Workers also pointed to the unpredictability of their work schedules. "It's about you having a voice, having a right to choose and being at the bargaining table when they make a decision about your benefits," said Betty Jones, 44, a technician. Jones said she felt as if she was being "brainwashed" in meetings with plant managers about the UAW. "It would make me feel so much better" if Nissan allowed workers to vote on a union, she said. Analysts said the union would be smart to rally workers around issues like having a voice in the workplace because high wages and ample pension plans that were once enjoyed by UAW members have been eroded. "By reinventing themselves as a civil rights movement - that's the right way to go," said Gary Chaison, professor of industrial relations at Clark University in Massachusetts. The UAW can say, 'We can give you something that is very important and that's a voice in the workplace. For workers who are seldom asked what they want, that means an awful lot." Nissan began making vehicles in Canton in May 2003. The $1.4 billion plant makes five models, including the best-selling Altima mid-size sedan, and can make 400,000 vehicles a year. The plant began building the 2013 Altima this week. In 2005 and 2007, the UAW failed to muster the necessary support from workers in Canton required by U.S. labor law to hold an election, Reuter said. "We know there's been a lot of misinformation being communicated on the outside," Reuter said. "We know the UAW has been attempting to engage our employees at their houses and in the local community, and we want to make sure our employees had our version of the facts as well." 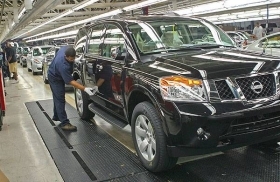 Nissan has prepared a presentation for workers on the UAW's history that touches on its full history but concentrates on the reasons for the decline of UAW membership over the last decade. "We're giving them factual information about the history of the UAW and the lack of success that they have had with their employees and with the companies that they've represented," Reuter said. But King is eager to show a new UAW has emerged from past practices that helped submarine the dominance of Detroit's auto manufacturers and that the union is a better partner with management. He points to the union's labor contracts with General Motors, Ford Motor Co. and Chrysler Group LLC as evidence of the UAW's new flexibility. King's organizing push is founded on the belief that if car companies refrain from actively opposing a UAW organizing push, workers will enthusiastically join the union. After given access to workers at auto parts supplier Dana Holding Corp., workers approved union membership in 2007, including a plant in Kentucky that had overwhelmingly voted the union down four years earlier. "We can't be a meaningful union, we cannot do the job our members at Ford, GM and Chrysler deserve if we don't organize the total industry," King said last month during an interview with Reuters in New York. Historically, plants in the American South have been hostile to unions. In 2001, workers at Nissan's plant in Smyrna, Tennessee rejected UAW representation two-to-one. Mississippi Governor Ken Bryant last year said he would step in if the UAW tried to organize a plant in the state. "I just don't think that now is the time to try to unionize any of these organizations," he told Reuters in an interview late last year when he was governor-elect.